Big Passion For The Big Easy: Gators and Ghosts is a small, locally-owned and family-operated tour agency with a passion for all things New Orleans. Our guests consistently leave us 5-star reviews because of our expert advice about New Orleans tours, friendly customer service and because we send them on once-in-a-lifetime experiences that they will absolutely never forget! We are members of the French Quarter Business Association and New Orleans & Company (NOLA’s convention and visitors bureau). Call 888-481-8188 for reservations and more information. Want to save $10 just for booking with us? Use promo code SWAMP10 at checkout to knock $10 off any order over $100. Prices listed are per person. “Quantity” refers to the number of guests in your party, not the number of boats. We can pick you up from most major hotels in the French Quarter and Central Business District. Private Tours: Private Tours are available for groups as small as 1 or as large as 100. Private tours are great for bachelor and bachelorette parties, corporate gatherings, church groups, conventions, fans coming in for sporting events, family reunions and more. If your group is 30 people or fewer, we can fit you on one boat. If it's more than 30 people, we can split you across multiple boats. 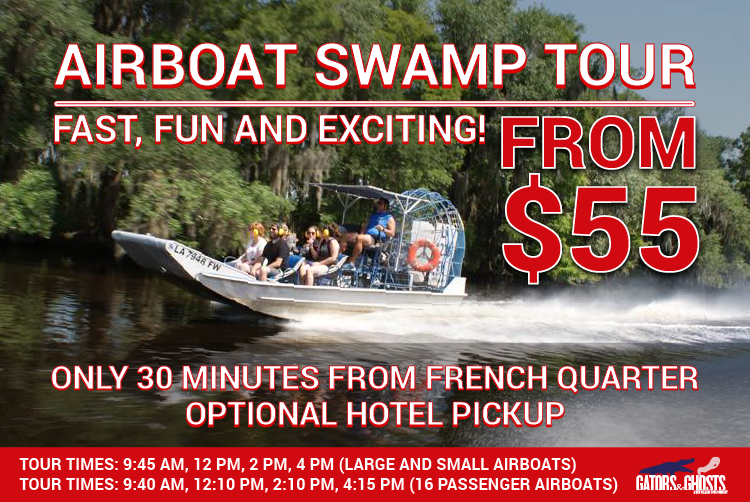 Contact us at (888) 481-8188 or reservations@gatorsandghosts.com for a quote. Private tours should be booked as far in advance as possible. We can pick you up at most hotels in the French Quarter and Central Business District. If you are not staying at a hotel, we can figure out which hotel would be closest and arrange to meet you there. Contact us for details.